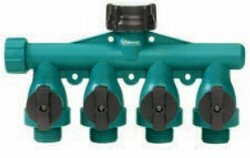 FULL FLOW 4 ports with full flow valve, plus on extra 3/4 garden hose end with cap. Full 3/4" on all legs. Flows 45% more water than traditional garden valves. Swivel connection. Poly body.